Description: Plato�s Parmenides and Its Heritage presents in two volumes ground-breaking results in the history of interpretation of Plato�s Parmenides, the culmination of six years of international collaboration by the SBL Annual Meeting seminar, �Rethinking Plato�s Parmenides and Its Platonic, Gnostic and Patristic Reception� (2001�2007). The theme of volume 1 is the dissolution of firm boundaries for thinking about the tradition of Parmenides interpretation from the Old Academy through Middle Platonism and Gnosticism. The volume suggests a radically different interpretation of the history of thought from Plato to Proclus than is customary by arguing against Proclus�s generally accepted view that there was no metaphysical interpretation of the Parmenides before Plotinus in the third century C.E. Instead, this volume traces such metaphysical interpretations, first, to Speusippus and the early Platonic Academy; second, to the Platonism of the first and second centuries C.E. in figures like Moderatus and Numenius; third, to the emergence of an exegetical tradition that read Aristotle�s categories in relation to the Parmenides; and, fourth, to important Middle Platonic figures and texts. Contributors to volume 1 include Kevin Corrigan, Gerald Bechtle, Luc Brisson, John Dillon, Thomas Szlez�k, Zlatko Ple�e, Noel Hubler, John D. Turner, Johanna Brankaer, Volker Henning Drecoll, Alain Lernould. 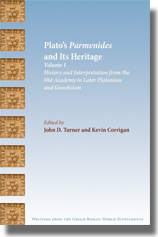 Citation: Thomas P. Nelligan, review of Kevin Corrigan and John D. Turner, eds., Plato's Parmenides and Its Heritage, Volume 1: History and Interpretation from the Old Academy to Later Platonism and Gnosticism, Review of Biblical Literature [http://www.bookreviews.org] (2014).